Hello all, I hope you are all well! It's been a while since I last posted as I've been busy working and sneaking in the odd hour or two watching the Olympics. I'd love to know how you're all enjoying the games and if not why not? Anyways... Since beginning my project pan, I've had an obsession with setting myself challenges and goals. Now for those of you that have read my other posts, you'll know that Clinique's 3 step has always been my skincare go to but I'm not seeing the results anymore... I felt it was time to get myself back on the skincare market and see what's out there. The first thing I will say is that my skin isn't particularly prone to breakouts. I get the odd spot or two if I've been lazy when removing my make up but other than that it's generally clear. That's not to say my skin doesn't have issues, it does; lots of them. My primary concerns are blackheads around my nose and redness on both my nose and cheeks. The redness I can deal with as I've always had it and I'm pretty much resigned to the fact that's it's not going anywhere in a hurry. My blackheads on the other hand, I can tackle these bad boys. 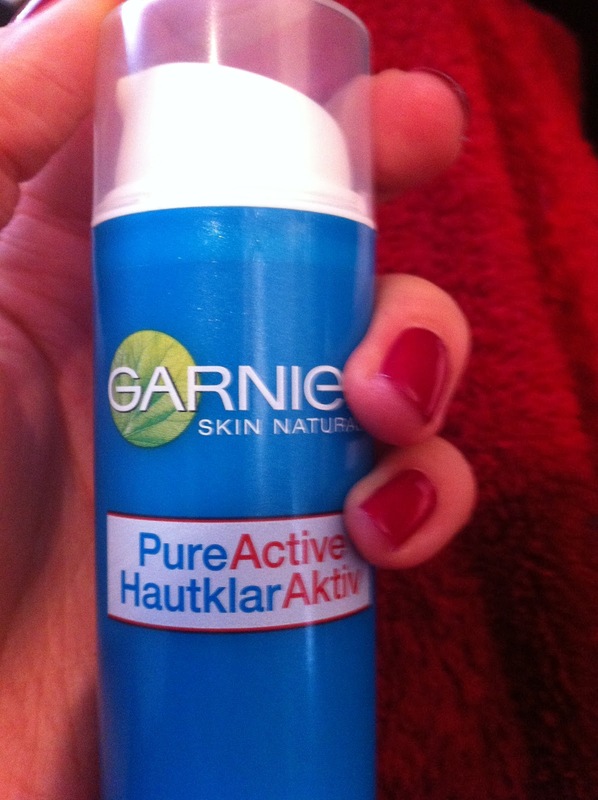 After a good fews hours pouring over the various products as well as consulting reviews on Make-up Alley and such I eventually decided I would give the Garnier Pure Active range a try as it seemed to be the range that the majority of people saw some kind of results with. At the time I purchased them, Superdrug had a 3 for 2 offer on skincare so I chose the Blackhead Clearing Scrub; Deep Pore Unclogging Wash and Spot Purifying Toner. At the time I got these, Superdrug didn't have the matching moisturiser in stock, but I managed to find it in Boots with a third off so I snagged a little bit of a bargain there too. I must say, although the packaging isn't anything to shout about, it's practical and I like the red and blue colour scheme. The most usefully packed I guess you could say are the Unclogging Wash and the moisturiser; both have pump systems which means you can dispense as much as you need or want. This cuts down on waste and just makes everything a little less messy. I will say, if you do decide to purchase the Unclogging Wash, you absolutely do not need one whole pump of the product; half a pump is more than enough. 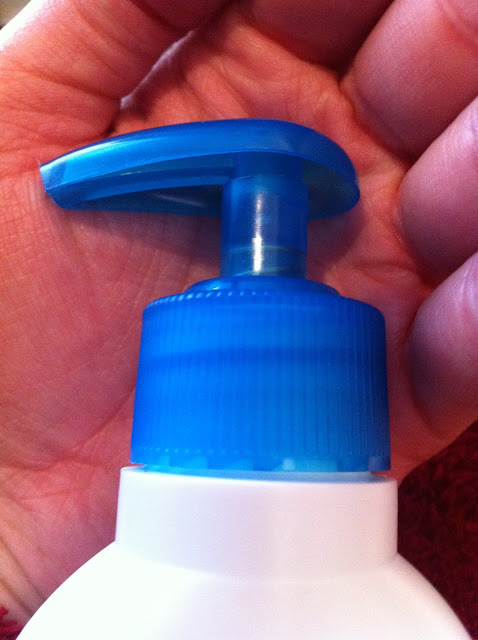 The Unclogging Wash is a thin, blue gel like liquid which foams really well in the palms of the hands. Because it's so thin, a little definitely goes a long way so the 200ml will go a long way. 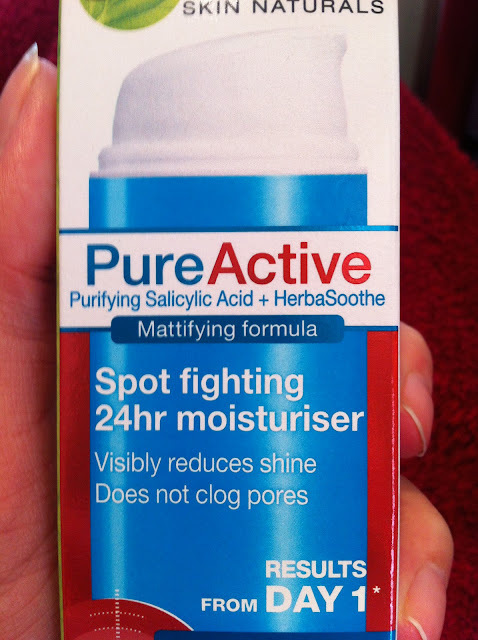 The blurb says it contains 2% salicylic acid and Herbasoothe both of which work together to fight spots and fade marks. Herbasoothe I'm going to guess is an ingredient unique to this line of products and according to Garnier it is a "natural active derived from Blueberry" which they say soothes and cares for the skin. 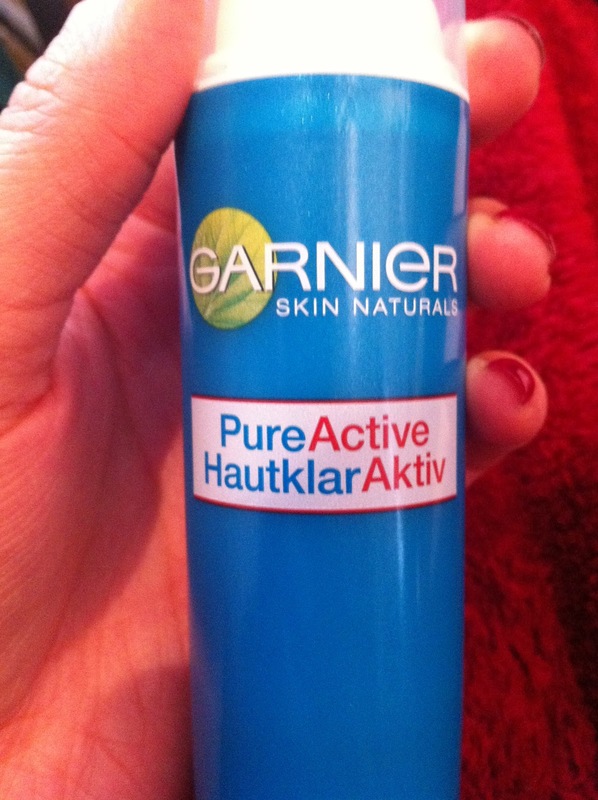 I've been using this product morning and night for over a week and so far so good. 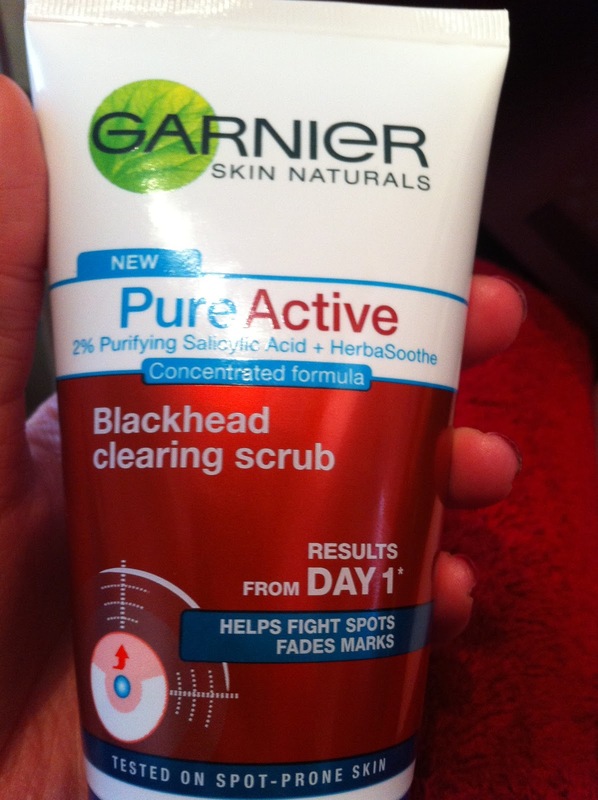 My pores definitely appear reduced in size which I love but I feel that my expectations of this product are too high at the moment, so I'll be disappointed if blackheads are still there after I've used it for a good period of time. I'm hoping that this wash can indeed unclog my pores so I'll be sure to keep you all posted. The Blackhead Clearing Scrub is a thicker, pearly white gel with tiny blue micro beads suspended in it. 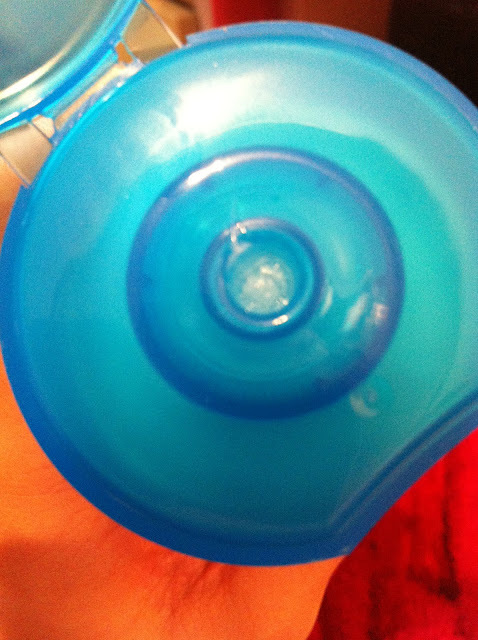 It has similar properties and promises as the Unclogging wash but in some ways I expect more from this as in my mind, these little micro beads can get the gunk out. I know it's supposed to be a daily facial scrub, but on the occasions I have used it, it has aggravated the redness on my face so I don't think my skin would enjoy going through that twice a day. As a result, this will be a twice/ three times weekly treat. That said, although red, my face was lovely and smooth. 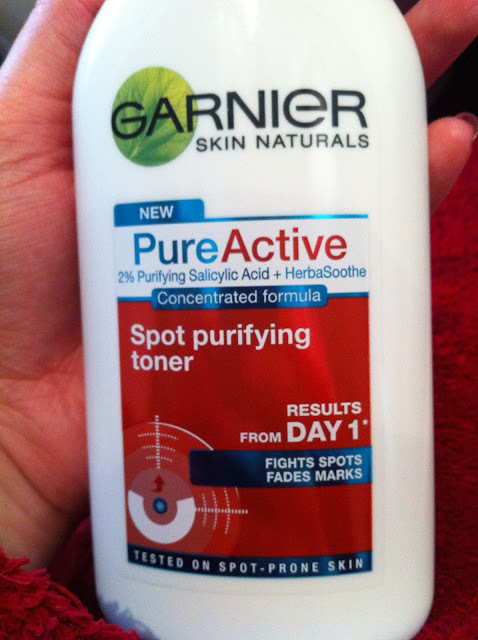 The Purifying Toner and Spot Fighting Moisturiser are the ones that will make the biggest difference in my opinion. It's all good and well to include salicylic acid in washes and scrubs but I don't think they're on the skin long enough to make a difference. However, both the toner and moisturiser contain salicylic acid as well as the Herbasoothe and as they are washed off the skin, they can penetrate and work their magic. The toner is just a simple turquoise liquid which you sweep over the skin with a cotton ball. It feels really refreshing on the skin and despite seeming so harsh, it doesn't make skin feel uncomfortably tight. 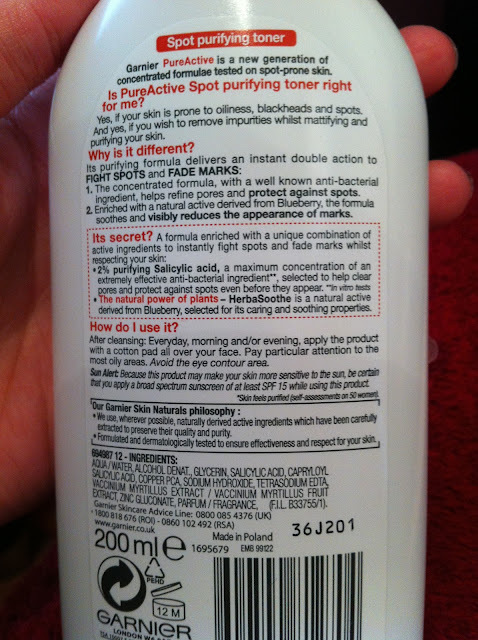 I wouldn't recommend rubbing the toner into the skin again and again, just one sweep or you run the risk of redness. 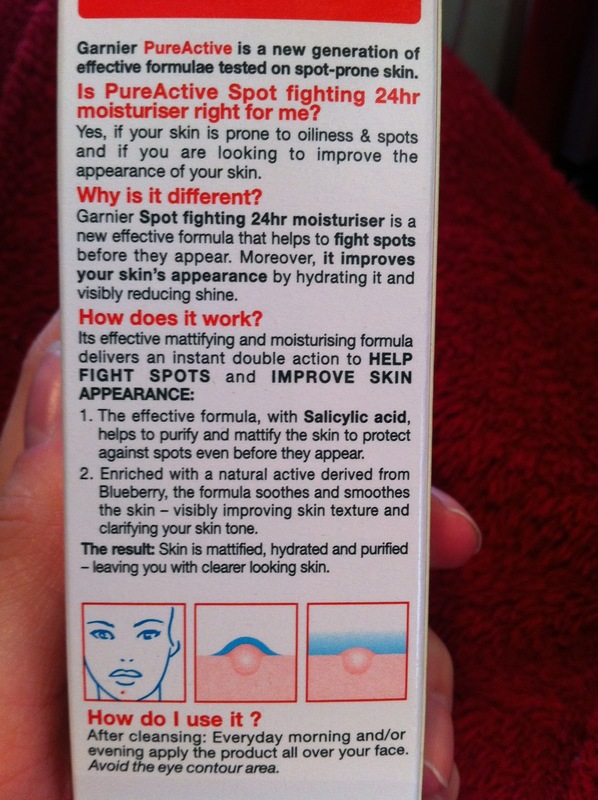 The moisturiser is just a pale blue cream, so again nothing too unique. I will say however, that it mattifies my oily skin really well, so much so that I don't need to apply powder any more. 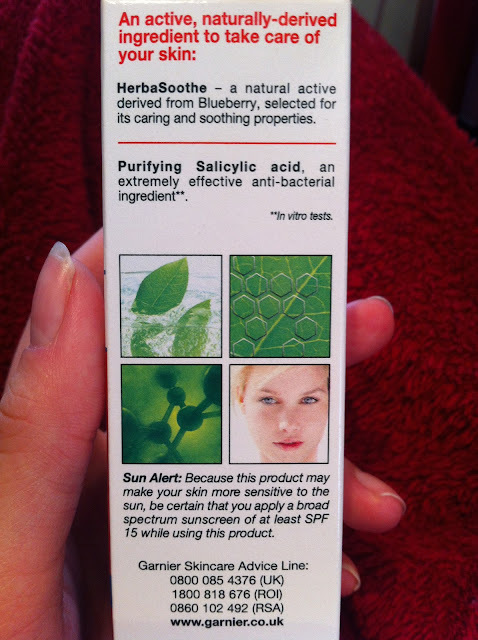 One of the problems with this line is that it can make skin more sensitive due to I'm assuming the harshness. There is a 'sun alert' on both the moisturiser and the toner so you have to use something with SPF in over the top (be that make-up or sun cream). 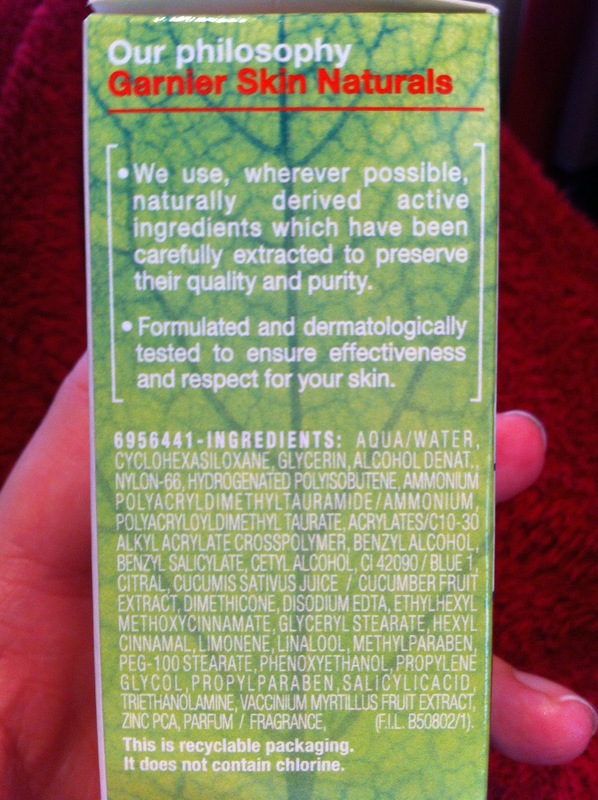 I think Garnier could definitely improve this product line by adding an SPF to the moisturiser; there's no point putting warnings on the side of the box if you can add something to your line to counteract the need for such a warning. Now I'm not a chemist or anything but it's just a suggestion to make life a bit easier. I'm also not a fan of the scent. 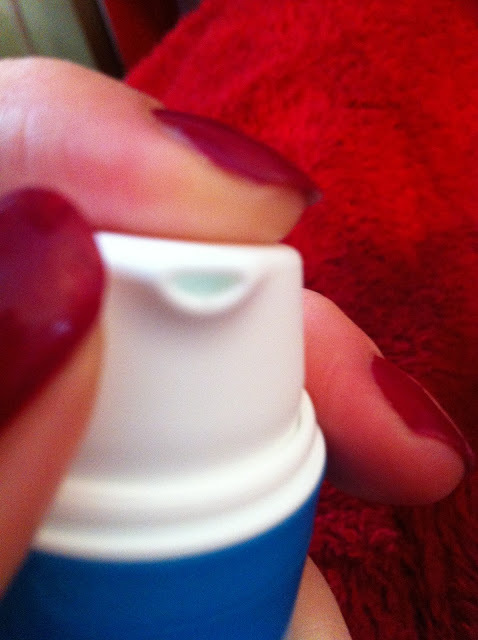 It's minty fresh with a herbal edge and it just isn't very enticing in my opinion. That said, the scent doesn't linger on the skin for too long so I can live with it for the right results. Due to the scent and the harshness of the formula, I'd warn people with sensitive skin to stay well away from this (Simple actually do a really great line for blemished but sensitive skin). Issues aside, it's a nice little line with a lot to offer if the products can live up to their claims. The prices are really reasonable as they're generally around the £5 mark but I would always say shop around because more often than not there are offers on this type of skincare. Overall, so far so good, I'm really enjoying the results and I love being able to visibly see that my skin is improving day by day. I'm just hoping these results continue.. I'll be sure to keep you all posted! 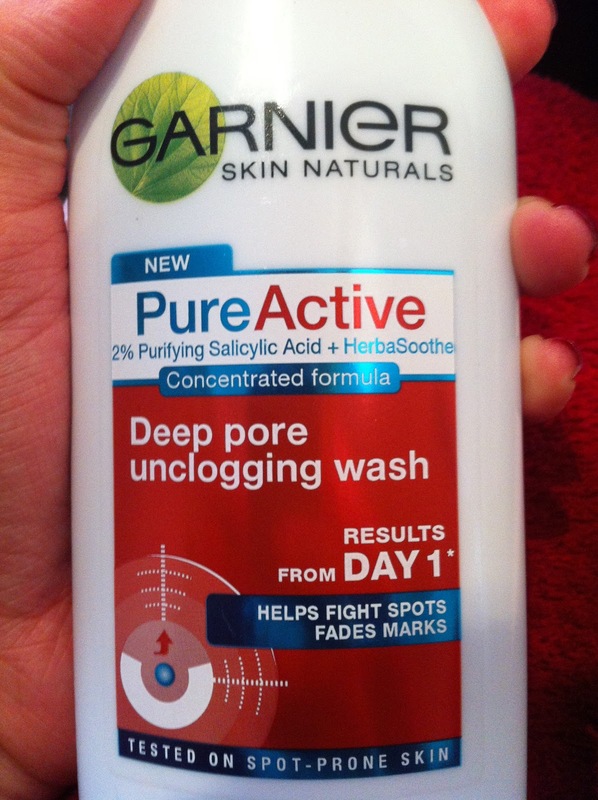 Have any of you tried the Garnier Pure Active Range? What did you think? If not, what's your secret to banishing the blackheads? Feel free to ask questions/ leave comments.